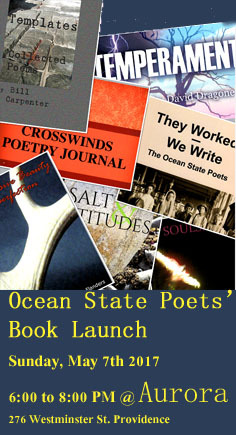 Ocean State Poets’ Book Launch slated for May 7! Come join us at the Ocean State Poets’ Book Launch, Sunday, May 7, from 6 p.m. to 8 p.m. at Aurora, at 276 Westminster Street in Providence! Admission is free and the event is open to the public. I’m short on some of the details right now, but Mark Taber will provide music, and there will likely be refreshments served. I will get a list of books that will be available at the launch for signing and post it soon. This entry was posted in Events, News and tagged Aurora Providence RI, Ocean State Poets, readings and book signings in Rhode Island.